Good quality at a low price - impossible? Lenovo attempts to fulfill this promise by releasing a middle-class convertible laptop playing in the upper league. You can read in this detailed review if this concept adds up. Positive: Nice design; great built quality; comfortable keyboard; decent speakers. Negative: Overheats while using; no SD card reader. Positive: Great built quality; compact size and light weight; excellent keyboard; high performance; fast charging. Negative: Short battery life; poor display. Model: The Lenovo Yoga 730-13IKB is a 13-inch convertible laptop. With high-definition clarity on a 13-inch touchscreen display, extraordinarily smooth processing and pen support, users will be immediately ready to galvanize the troops and win the day no matter what challenge lies ahead. The Yoga 730 13” is true multi-mode device, elegantly designed to be equally stylish in tablet mode and laptop mode. It is available in sophisticated Iron Grey. Weighing in at a featherlight 1.12 kg / 2.47 lbs and polished in premium aluminum, the Yoga 730 will complement users style no matter where the day takes. As for hardware specifications, the Yoga 730 is packed with speed and power to amplify their productivity. It is equipped with an Intel Core i7-8550U CPU, 8 GB of RAM, and an integrated Intel UHD Graphics 620 GPU. Storage was taken care of by a Hynix 512 GB PCIe NVMe SSD. The latest 8th generation Intel Core i7 processors offer up to a 40 percent performance boost with unprecedented touchscreen and pen responsiveness, faster boot-ups, and seamless multitasking. For display, with the razor-thin 5.9 mm bezel screen, the Yoga 730 displays movies, videos, and Skype calls in clear high-definition. With 300 nits brightness, which is a good level of brightness, users will see every detail on the screen. A user can also experience truly immersive sound with Dolby Atmos, which creates a three-dimensional audio space. Sound comes alive with fullness and depth when a user listens through headphones. To further enhance the user experience, the Lenovo Active Pen 2, sold separately, provides the natural feel of a pen-on-paper experience. With 4,096 levels of pen sensitivity, it has twice the accuracy of competitors’ pens. A user can click the Bluetooth-enabled pen just once to open Windows Ink. They can also draw on a map to get turn-by-turn instructions, get creative and draw, paint, scribble, and more. Thanks to Rapid Charge technology, fifteen minutes of charging will give two hours of use, which is useful for users on the go. And with up to 11.5 hours of battery life, users never be slowed down by a dwindling battery. 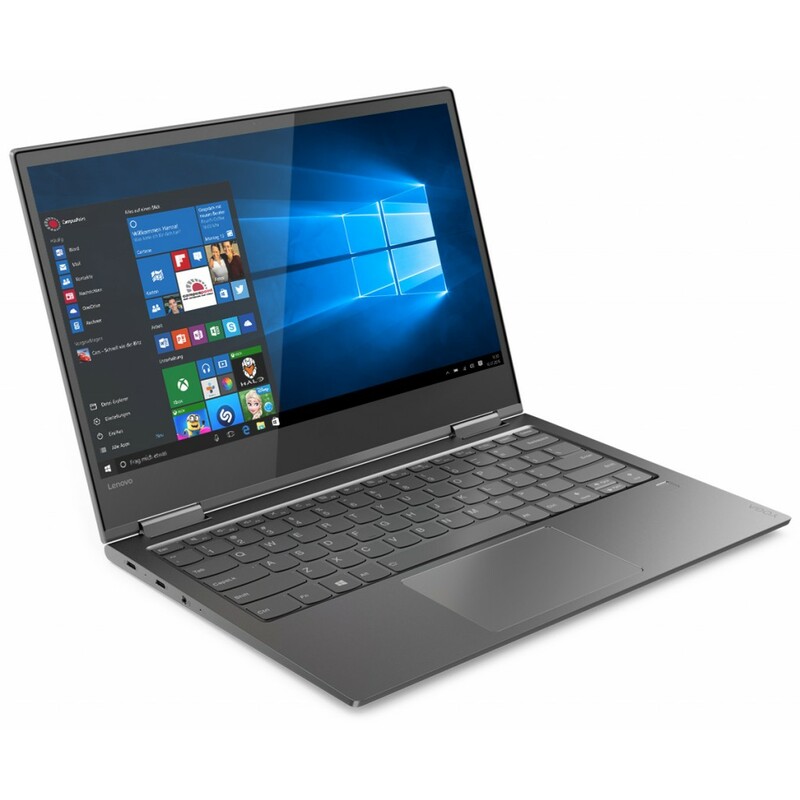 As for connectivity, featuring the revolutionary connection technology of dual Thunderbolt 3 USB-C ports, the Yoga 730 offers a swift, versatile connection to high-res displays, high-performance data devices and more, all while charging at faster speeds. As a conclusion, the Lenovo Yoga 730-13IKB is a versatile device which is great for users on the go. For office and school work, this is just a solid pick and a good value to boot if a user wants a thin and light laptop. 85.46%: This is a good rating above average. Nevertheless you should not forget, that 10-15% of all notebook-models get a better rating.